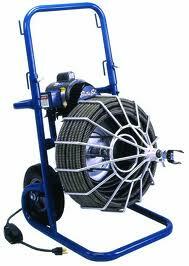 Clear tree roots and other difficult obstructions in 3 to 10 drain lines. Cage holds 100 feet of 3/4 or 5/8 Flexicore cable. Quick-Grip chuck secures the cable during operation. Special roll bars to protect the motor. Rolls smoothly on big 10 ball bearing wheels. * Please call us for any questions on our 100ft electric sewer snake 3/4 inch cable rentals in Kokomo IN, Logansport, and Central Indiana.